An oil is any substance that is in a viscous liquid state ("oily" state) at or slightly above ambient temperatures, and is both hydrophobic (immiscible with water, literally "water fearing") and lipophilic (miscible with other oils, literally "fat loving"). Thus oils are nonpolar substances. The general definition of oil includes classes of chemical compounds that may be otherwise unrelated in structure, properties, and uses. There are many types of oils, including vegetable oils, petrochemical oils, and volatile essential oils. They are used for food, fuel, lubrication, and the manufacture of paints, plastics, and other materials. Specially prepared oils are used in some religious ceremonies as purifying agents. Several edible vegetable and animal oils, and also fats, are used for various purposes in cooking and food preparation. In particular, many foods are fried in oil much hotter than boiling water. Oils are also used for flavoring and for modifying the texture of foods (e.g Stir Fry). Health advantages are claimed for a number of specific oils such as omega 3 oils (fish oil, flaxseed oil, etc) and evening primrose oil. Trans fats, often produced by hydrogenating vegetable oils, are known to be harmful to health. Most oils burn in air generating heat which can be used directly or converted into other forms of energy in the usual ways. 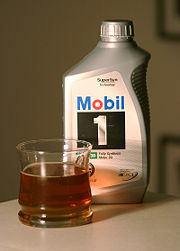 Oils are used as fuels for heating, lighting (such as a kerosene lamp), powering combustion engines, and other purposes. Oils used for this purpose nowadays are usually derived from petroleum (including fuel oil, diesel oil, and gasoline), though biological oils such as biodiesel are also used. Given that they are non-polar, oils do not easily adhere to other substances. This makes them useful as lubricants for various engineering purposes. Mineral oils are more suitable than biological oils, which degrade rapidly in most environmental conditions. Crude oil can be processed into plastics and other substances. Many oils have higher boiling points than water and are electrical insulators, making them useful for liquid cooling systems, especially where electricity is used. Color pigments can be easily suspended in oil, making it suitable as supporting medium for paints. The slow drying process and miscibility of oil facilitates a realistic style. Oil paints have been used since the fifteenth century. Oil has been used throughout history as a religious medium. It is often considered a spiritually purifying agent and is used for anointing purposes. Oil allows massage strokes to glide along the skin. The oil is selected based on the viscosity for the type of massage being conducted. A relatively high-viscosity oil such as almond oil may be used for a luxuriant, slow style; a lighter oil such as grape seed oil may be selected for a rapid approach. Scents may also be added. Petroleum is considered a nonrenewable resource, and burning it produces carbon dioxide, a greenhouse gas. Biological oils are renewable and do not produce net carbon dioxide, but require land to grow. Both also produce pollutants such as nitrogen oxides (NOx). Conaway, Charles F. 1999. The Petroleum Industry: A Nontechnical Guide. Tulsa, OK: PennWell Pub. Co. ISBN 0878147632. Gunstone, F. D. 2004. The Chemistry of Oils and Fats: Sources, Composition, Properties, and Uses. Oxford, UK: Blackwell Pub. ISBN 0849323738. Gunstone, F. D. 2002. Vegetable Oils in Food Technology: Composition, Properties, and Uses. Chemistry and Technology of Oils and Fats. Osney Mead, Oxford: Blackwell. ISBN 0849328160. Raymond, Martin, and William L. Leffler. 2006. Oil and Gas Production in Nontechnical Language. Tulsa, OK: PennWell Corporation. ISBN 1593700520. This page was last modified on 2 April 2008, at 13:27.